Your website is the basis of who and what you are online. It is your avatar in the matrix. Your robot in the war. Make it good. Development of a website can from a theme or an involved process. 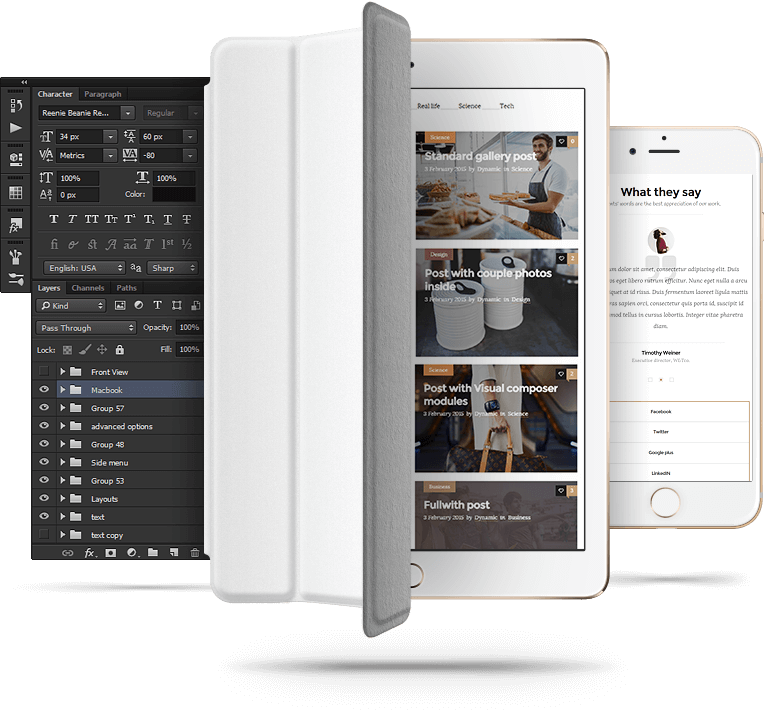 A theme delivers a product quickly, whereas a custom design you get to tweak every element to your heart’s desire. Websites, like any software, need to be constantly updated and looked after. We provided update, backup and security solutions on a monthly retainer basis. Having a great website is a great foundation for online marketing. The better the experience, the more likely visitors will turn into clients and the higher search engines regard your website. WordPress is open source software you can use to create a beautiful website, blog, or app. Beautiful designs, powerful features, and the freedom to build anything you want. WordPress is both free and priceless at the same time. 32% of the web uses WordPress, from hobby blogs to the biggest news sites online. The digital product design platform powering the world’s best user experiences. Your entire product design workflow — connected. Create rich interactive prototypes. Seamlessly communicate, gather feedback, and move projects forward. Explore your team’s best ideas on a digital whiteboard. Beautifully collect and present designs, inspiration, and more. Trello is the easy, free, flexible, and visual way to manage your projects and organize anything, trusted by millions of people from all over the world. Infinitely flexible. Incredibly easy to use. Great mobile apps. Trello keeps track of everything, from the big picture to the minute details. Dropbox brings your files together, in one central place. They’re easy to find and safely synced across all your devices—so you can access them anytime, anywhere. No more wasting the day tracking down work. Dropbox is a modern workspace designed to reduce busywork – so you can focus on the things that matter. Did you know that mobile devices outnumber traditional desktop devices by 3 to 1? Did you know that many countries has 100% mobile market penetration? Did you know that Google cares more about how your website does on a mobile device than on a desktop? Did you know this influences your conversions? Always a pleasure working will Willem and his team. If you are looking for great value then GLYPH is the place. Always going the extra mile. Thank you Glyph!